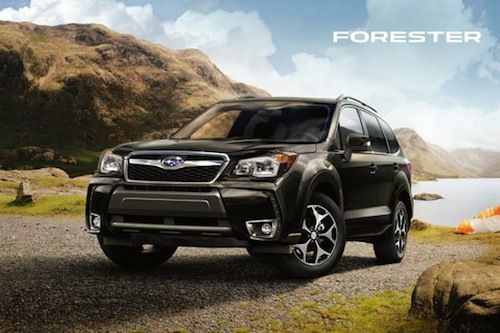 The all-new completely redesigned 2014 Subaru Forester has been released in Canada with pricing and offers even more value than the previous generation model. The all-new fourth-generation 2014 Subaru Forester is the newest reincarnation of the Forester line and will maintain its reputation with Canadians as being a safe, versatile, and all-weather capable all-wheel-drive SUV. The 2014 model is an evolution rather than a revolution in its redesign. The 2014 Forester makes its debut in Canada with new exterior styling, a roomier interior, improved fuel economy and a new turbocharged 2.0-liter engine. Subaru Canada released pricing information on the new 2014 Forester and it's set to deliver plenty of value for Canadian mid-size crossover buyers. The well-equipped base 2.5i model with a six-speed manual transmission pricing starts from $25,995, and the new turbocharged 2.0-liter Forester 2.0XT has a starting price from $32,495. All Forester models get a price increase over the previous generation models, but they are loaded with intrinsic value for Canadians. The evolution of the Forester continues and this new generation model will feature the standard naturally aspirated 2.5-liter Boxer engine that was introduced in the outgoing model. It will still have the same 170 horsepower and 174 lb ft of torque, but will get a nice bump in fuel mileage. The 2014 Forester will lead the segment in all-wheel drive fuel economy, with the 2.5i CVT (continuously variable transmission) model achieving manufacturer’s fuel economy estimates of 6.2 litres per 100 kilometres on the highway. That’s a significant increase and compares well with competitors that only feature front-wheel drive. Canadians will be excited about the new evolution of the engine options for the new 2014 Forester. Subaru has updated the engine in the new fourth-generation model and in addition to the naturally aspirated 2.5i, it comes with an all-new 2.0-liter direct-injection turbocharged Boxer engine producing 250 horsepower and 258 lb ft of torque. It will also come with a new intercooler for increased performance. The new 2.0-liter will replace the outgoing 2.5-liter horizontally opposed turbocharged four-cylinder engine in the Forester 2.5XT model. The evolution of the Forester also continues with the new X Mode for off-road fun for Canadians who lead active lifestyles. Key features of the turbocharged Forester 2.0XT Touring include SI-DRIVE, 18-inch aluminum alloy wheels, a power driver's seat and extra-large sunroof. The Forester 2.0XT Limited additionally offers leather seating surfaces, a power rear liftgate, high-intensity discharge headlights with LED accent lighting and auto-dimming door mirrors with approach lighting, among many others. EyeSight, as well as navigation with smartphone integration and Aha radio, is available as an option on the Limited Package. Canadians will feel safe in the new 2014 Forester. Subaru has established a distinguished reputation for safety, and the Forester has earned the Top Five-Star Rating in the Euro NCAP Safety Test. This is the highest possible rating a car can get in the 2012 European New Car Assessment Program (Euro NCAP) safety performance test. Subaru also announced the new Forester has earned the Insurance Institute for Highway Safety's (IIHS) Top Safety Pick. New safety features for all 2014 Forester models include anti-whiplash front seats, a driver's knee air bag, Brake Override and an impact-sensing fuel system cutoff. The Brake Override system cuts engine power if the driver applies both the brake and accelerator beyond a certain threshold. During airbag deployment, the new impact sensor cuts fuel supply to the engine. The newly redesigned 2014 Subaru Forester is set to deliver Canadians even more value, with the well-equipped entry 2.5i model with improved fuel mileage and the improved performance of the turbocharged Forester 2.0XT. The 2014 Forester is set to arrive in Canadian dealerships in early spring. Best CPO Deals: Is Subaru Certified Pre-Owned Incentive The Best?